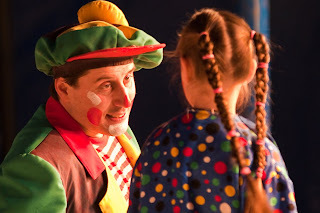 Here are a couple of circus pictures taken in Rösrath on Christmas Day with my new Tamron 2.8/70-200 lens . This was Pepino (the father) and Banane (the 7-year-old daughter). Fiona was impressed by the little girl and has been doing some circus tricks for visitors ever since she saw the circus. 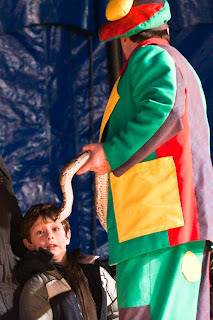 Pepino showed a large snake to the crowd. 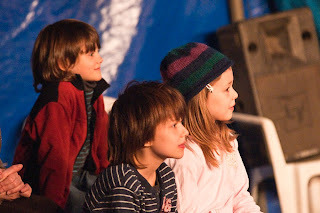 Ivo, Fynn and Fiona loved the show! 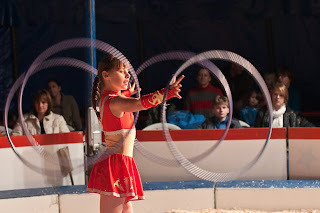 Deborah juggled, did some numbers with animals and shone with her hula hoop prowess. Would you let your husband throw knives at you? This look seems to say, "Concentrate, pleeeeze!" 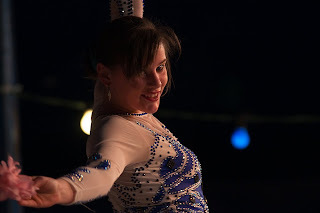 The 16-year-old daughter was very limber and did some gymnastics numbers as well as some hula hoop magic.